-Acrobatic Sea legs: Feats of acrobatics on a ship are n small feat. While on a ship, any jumps or climbing which utilize the the ship's structure are done at 15 m/s. -Trusty Blade: One-Eye attacks twice with his sword, each swipe dealing C tier damage. -Rustic Shot: One-Eye has a magic tool which can fire a ball of fire at 20 m/s for B tier damage. -Sword Swipe: Deals D tier damage to an opponent. Today was a very chilly day as Val was walking to the port. Lagi sent him on a mission to help out with the port. Lagi said there was some muscle work so Val needed to head there soon. Lagi also said there would be someone to help me but he did not know who. Who would it be? Must have been somone who was strong. Val then arrives at the port to see a Captain. He had some supplies around him and he was talking with somone. Must have been one of his privates. Val then steps forward but as he does, he can see another person. It was a man with blue hair. Val guessed he was a immuchak. As the main was walking, Val can feel that the man was sad and depressed about something but Val could not put his hand on it. After having some time alone in his Onyx house in the woods which most of it was spent either sleep or staring at nothing eventually someone came and knocked on his wall and then Solomon would stand up and look to the man, he was quite small but could easily tell it was a messenger with the bag he carried, he stared at him for a bit before he stepped up with a letter and once Solomon grabbed it the man then would just turn and run back towards the town. There was a L on the letter Solomon knew it would be for Lagi then, opening it to read it he would see that it was a job request, at first he would walk to his bed and then lay down once more letter the letter drop with his hand to the bed. After a couple moments later he would bring it above his face again and read it, “Hmmm another Captain eh? And Pirates they should be quite easy to deal with no?” He let his arm drop again and stared at the ceiling for the next five minutes then eventually he forced himself up and walked out the door after patting Largo on the back, “More water stuff buddy you can stay home and relax today.” Largo would lay his raised head back down to the ground as he watched his master leave. Getting to the port he would easily see the ship that was referred to as the Shark’s Fin and he would make his way to the ship with letter in hand, he would walk up to the captain who was quite obvious as he was shouting out some orders then talking to his right hand, Solomon would walk up to the two knowing that preparing for a ship could go on forever if he just waited for a open time and as he walked up he would say over top of them, “I’m here as muscle to deal with your pirate issue.” He would say as he held out a letter to the Captain, he would be able to tell that the man he was talking to was a bit pissy but he at this moment really could care less. The captain would just look at him and examine him, “Then get aboard.” He would say as if he was irritated, as he waved for the other man to take him to where he could stay. “You can give a hand on dock as we travel we make sure every man is useful on this ship” the second man would say. Solomon just grinned and laid back on some of the crates they still had to put aboard, “I’m not doing anything other than the job I signed up for or you can go back and tell your captain you just lost your muscle, I do as I please, not what others think they can make me do.” The man would stare at Solomon for a moment however after he realized Solomon stopped paying attention to him almost right after he finished what he said the man would then walk away and start helping load the ship. Solomon kept his eye’s to the ground as he thought to himself about the current state of his family and he would keep in mind what Hayato looked like. Val was about to talk to Captain Harken, but then the man goes up to the captain and gives him a letter, saying I am here to deal with the muscle issue. Then the man got pissed off and was angry at the other man. Val then sees him doing his work, as if nothing happened. Val looks at the man. The warrior can sense the man's despair and sadness from his aura. "Hello Sir. My name is Val Achilles. Lagi sent me to help you out with this. Is it fine if you can help me? Also, my boss did not give me enough information, if you don't mind me asking, what is your name?" Solomon would come out of thought to look up and see a human man in front of him quite a bit smaller then himself, his hair was black which matched his eye, he would examine the man as he mentioned that Lagi was the one who sent him. "If you wish too, Im not one who to disrespect a friends choice ... but you do not need to know my name for this job." he would then look over to the captain and the crew as he would then say, "Apparently there is a couple pirates that they can't handle that they are worried about, that is why we are here to go out with them and deal with it. "He would then stand fully and he would then turn to walk aboard, "There is no reason to help them along with packing up, that is not the reason we are here for and they will shortly after forget us anyway." He would then find himself along the opposite side of the deck looking over the side waiting for the others to be ready, he would then sit down and and place his back against the wall as he hated going out into the vast water but he knew he needed the money for his family. Val thought about what the immuchak man said. He was not friendly at all. He would not give his name nor would he be willing to help out. He was either very rude, or just very sad. "What should I call you by if I do not know your name?" Then Val looks at him, examining him. He was definitely an immuchak. "I mean we may get a better reward if we help out." Val then puts a box inside the ship, helping out them. Then he comes back to see the man siting near the wall. Val lays his back against the wall, but not sitting. Val looks at the man, trying to understand him, but that man kept his thoughts to himself for sure. Val thinks about his life when he was so thoughtless and so....soulless. Val then got back to the real world when the captain started talking. He was standing tall. "Alright. Look at the distance." Then the Captain pointed almost right behind the immuchak. "That is the pirate nest which I need your help taking over." The object in the distance had a pirate flag. It was a big ship, however it did not have cannons so not a lot of fire power. Then the captain goes over to a small ship. It was a canoe which was very new and very smooth looking. "This is your boat. Not very big but good for sneaky entrances. On the enemy ship, there is a small entrance which this boat can fit in." Then the captain salutes the both of them. "Good Luck." “Call me Solomon if you must” Solomon would say later when Val came to the wall next to him, “Most will not reward those who do more then what is asked, they only care for what they need for themselves, just like how I am here for money just as you are or we wouldn’t be here at all.” Solomon would then stand as the captain pointed behind him and look over the side. Solomon looked to the small canoe as it came towards them, “Really? Why can we not just blow them out of the water from this boat?” The captain just looked at him and Solomon sighed as he got down in the boat, “You better not be far from us when we are finished.” He would climb into the canoe being very careful due to his size not to flip it, it would become aware to the most of him that he hated the ocean but he would then sit down and wait for Val to enter the boat. “What should I call you?” he asked as he picked up the paddle, figured it would go much faster with the power he could generate. It was not as if he was trying to be rude to Val it was just he did not trust anyone anymore at least any new people around him. “I know the captain obviously wished us to do this silently but I have no intention of doing so.... so what are your strengths as I may have to cover you and you may have to cover me.” He said this but he had no intention of having to have someone he did not know cover for him. Val finally hears the immuchak's name, Solomon. He really like the name, as it reminded him of the legends but whatever. Solomon then explains that Val may not get a lot of money because of this but Val was still happy to do it. Val is part of Reim and the Unity Corp so he should help, but at the same time its just a basic good dead. This man is very cold and rude toward Val which really irritates him. Val grabs his fists tightly but still controls his anger as he closes his eyes tightly. Relax He opens his eyes again to see the Captain talking. He wants to go in secretly but that will be hard. Now Solo is being very rude to everyone else from Val's eyes. Val sighed as he followed Solomon into the boat with silence. "You can just call me Val." This man is very annoyed but beneath that, Val can sense something, something much darker then annoyance. Then the man asks about his weaknesses. Val looks at the man as he draws his swords. "I am decent with the sword so I can protect myself but it would be harder to protect you." Then Val does a quick scan. "You can defend yourself, so don't worry about me." Val did not mean to be rude, he just liked to work alone. Also this guy may be emotionally dysfunctional so this may go bad, but Val still had to stay strong. Then finally they leave off to the ship. “Good, let’s worry about ourselves this way you can strike anyone near you without hesitation, makes things safer knowing you can go all out.” Solomon was quite use to it being that way, at least before Hohotaro came around but he has not seen him for some time, and had no other he could fight side by side as they did. But snapping back to reality as they came closer to the vessel, “So i’m going to make a big entrance for you, so make it good.” He would say and right when the vessel was in range Solomon would then use Amulet of Destruction and a rock would then be summoned that would be about 10 cm in diameter it would then shoot forwards towards the vessel at 25 m/s it would be full size by the time it hit the vessel then exploding when it hit the vessel causing major damage to the vessel lighting it ablaze, leaving a large hole in the upper part of the ship. He would wait a moment till Val would be head up the ship before he would head up himself just in a different section this way most of the attention would be drawn off him allowing him the possibility of a surprise attack. By paying 20 magoi the user is capable of summoning a pebble that is 10 cm in diameter. It is sent forward at a target at 25 m/s, though can move no further than 40 meters from its casting point. As it moves, it pulls dirt and the like about it into its mass, becoming 10-15 meters in diameter before exploding in a 25 meter diameter area and dealing A-Tier damage to all who are struck by the resulting explosion. A small 5 meter storm of miniature meteors fall about in a 5 meter area, slowing those who pass through it by 5 m/s. 7 post cool-down. Val looks at the hole in shock. Now he knows not to mess with this man. Val chuckles and jumps up into the ship. He looks around to see 2 people, probable lackeys. They were very weak and not worthy for Val to use his sword. Val chuckles as the 2 pirates draw there swords. "You think you can beat me." Then Val gets into a battle mode. Val can see that both of the pirates are 5m apart. Val can just take them out in one shot. The warrior gets out his slime told. He uses Gooey Cuff to shoot a poodle of slime which gives them both C Tier damage. They all faint to the floor as Val rushes over to a door. He examines the door as he tries to open it. He opens it to see a man attacking him. This man uses his Trusty Blade as Val uses his Parry. However it was not enough as Val drops his sword. Val then uses his Psyche and Faerie Dance techniques which totaled into B Tier damage. The Captain then uses his Acrobatic Sea legs to get away from Val but at the exact moment Val uses Boomerang which hit the captain as he falls down. The cpatain is beat up badly with bruises everywhere Val sighs as he sits down, breathing very hard. He tries to find Solomon Solomon was in the shadows, waiting for a counter attack. "Solomon, wherever you are, you can finish the guy off if you want." Description: Val throws a sword like a boomerang at 20 m/s in an arc up to 15 meters away and 15 meters wide to deal B-tier damage to anything it strikes. The way the sword is thrown causes is to come back to Val. Description: In this ability Val has speed of 15 m/s. Val strikes but misses on purpose, charging up for a back hand strike the chest. If the returning strike hits the opponent, it deals C-Tier damage. Description: Val spins around with his swords at 15 m/s, dealing C-Tier damage to whatever it touches. Val is able to continue moving while spinning. Both of the blades of the sword are facing in the same direction. Description: In this ability, Val deflects an attack with his sword at 10 m/s, protecting from C-Tier damage. Solomon got to the top of the ship after Val but he was not expecting the first sight he would see were to be Val already rushing to the door after already dealing with two others. “Hmm decently quick.” He would say out loud to himself, he would then watch as Val opened the door immediately to only run into an attack. As that played out Solomon would slowly walk towards the two of them, by the time he arrived at them he would see Val sitting down, "What do you mean do what I want... all that has to be done is to finish him?" He would say as he picked the pirate up then walked towards the side of the ship, he paused for a moment, "I guess the other guys would want proof of our little encounter just in case the explosion was not enough to convince them." If watching Val would be able to then see Solomon toss the man from the deck into there small boat down below, he would also hear a large thud. "We should probably get going.." he would begin to say as looking around the first attack left the boat on fire. "But good job dealing with them." He would finish saying before beginning his climb back down. He would await for Val at the bottom of the vessel, "Maybe I'll buy you a pint when we return." Val looks at Solomon as he picks up the captain and throws him on the boat. The human gets up to make sure he has all his equipment. The fire and heat burns near Val's face. Because of the dangers of having a ship burning down, Val and Solomon needed to leave. Val nodded to Solo's offer as he jumps into the boat. He grabs a rope from the boat and ties 2 knots on the Captain, one to cover the mouth and the other to tie the hands together. Then they head out, back to the port. As they arrive, Val puts the Captain on the boardwalk so then Harken can see that they did the job. Harken looks at the man on the floor and ends with a giant laugh. "Good job kiddos on catching this guys." Then the captain points over to the ship, burning to the ground. "Well next time try to salvage the ship, but over all it was amazing of what you did." Then the captain picks up 2 bags full of gold and throws it at Solo and Val. "Well here is your reward." Val looks inside to see a big reward and to respect the captain, he salutes to him. "Thank you for your reward." The captain smiles and heads into his ship, sailing off into the distance. Val looks at Solomon, ready to follow him. "So do you know any good taverns, or would you like me to direct you?" He is excited for a nice event but he really wants to get to know Solo, because the only way he can get World Peace is if he gets powerful friends, not the opposite. "Don't worry it will be on me." Solomon watched as Val tied two knots on the captain and covered his mouth, “Why are you doing that? It’s not like he can go anywhere and if he did scream out who would be there to help?” Solomon asked looking confused. But he would then shrug it off and when he returned the their ship he would listen to the captain speak, and laughed to himself as the captain said “next time.” Catching the bag of gold he would look into it verifying then shove it into his pack, “Thanks, if you need anything in the future let me know.” He would say and with a nod, then Solomon would watch the captain head to his quarters. During the trip back, which was not too long Solomon would discuss with Val, “I use to know a tavern, not any more however...” he would say silently, “... so i’ll let you lead the way, just if we may lets drink outside if there is such a place.” Outside he would at least have fewer thoughts brought back to him given less of an atmosphere of what he use to have. Even though however he was going to have a drink with this human and he was acting slightly kinder to him, he still did not trust him but he did decide however that he had to make it possible at least for trust to be earned. After arriving back to port he would then follow Val to where ever he decided to go. Val watched as Solomon gave a suggestion and Solomon's weird silent words peaked Val's interest. However, he does not want to get involved if he does not need to. Val makes hand sign to Solomon. "Follow me!" Val runs to the nearest market there, expecting Solomon to follow. As Val arrives, he faces Solo. "Wait here I will come outside. Just go over there where we can sit and chat. Don't worry it is private so nobody would hear us." Val points to a nice perch where you can see the a beautiful view of Reim. There are tables and chairs where anyone can sit. Val then goes inside the market to get some food. Val then comes back outside after a couple of minutes with some milk, bread, and vegetables to make a nice lunch. He rushes over to where the immuchak is sitting, not damaging the food. Val sits on the chair with Solo and gives some milk and a plate. "Want something to eat?" The warrior is a little tired and hungry from the fight but is not so sure of Solomon so he offers him a nice sandwich. Solomon was quite confused on why they had to run to the nearest market, but he followed anyway, when arriving he was going to ask why they had to run but then Val would tell him to wait outside and he would just leave it be. He would walk over to what looked to be a small deck just connected to the building, it was not set up as the chairs were stacked against the wall so Solomon took the time to un-stack two of the chairs and drag one of the table close to the wall a little ways from it giving the two of them enough space to sit. Val would then come back outside after a couple minutes, Solomon grinned slightly as he came back as he saw no pint or alcohol of any kind but vegetables and bread and a jug of milk. Solomon accept some food from Val he was not starving but it was about time that he would usually eat anyway, and he realized not everyone drinks or at least it is not their first thoughts whenever they get the chance. As Val prepared some food Solomon would look him over, he looked quite young and perhaps that is why he did not first think of such a drink and why a younger man of this age would be working for the government of Reim he was unsure but it was not his place to ask really. “How old are you anyway?” Solomon would ask out of curiosity, as he got up to find nearby cups for the milk. After finding them he would sit down and pour a cup for the both of them. Val looks at Solomon as he asks the warrior a question. What should the Val do? Should he say his real age, or lie to him? Val picks up the glass of milk that Solomon poured for him. "Thank you for the drink." Val drinks the glass of milk, but only a sip. He places the cup down as he wipes his face. "I am 18 years of age. How old are you?" Val asks with curiosity. He prepares a sandwich for both of them, but using a paper napkin, in order to not spread germs and look like a beast. He then sits back done eating his sandwich with great joy, as he hears Solomon's answer. “I’m 28 now, so quite a bit older.” Solomon would say as he drank the milk, “So where are you from ... are you from Reim? Or a explorer? ... I use to explore myself till I settled here, but I am thinking it is time for me to move once more.” He would end up taking the sandwich made for him as he listened to what Val had to say, “I use to have a tavern here in Reim that made some pretty good sandwich’s ... but I noticed you are a fighter do you not have any magic or anything else? If not you may need to work on your strength a bit more rather the doing a bunch of jobs, I’m sure Lagi would approve to your training rather than work as he is usually quite supportive at least he was with me when I was training and through my issues here in Reim.” He would then take a look around it looked as if it was getting quite late, “If you like we can meet up tomorrow and I can train with you? Before having magic my strength is all I focused on in my travels, however I am not saying I would be a better teacher then Lagi.” With either reply Solomon would then finish up what was on the table and bid his farewell back to his onyx house, it was not that he trusted Val but at this point no matter who it was what left did they have to take away from him? If Val agreed before parting Solomon would tell Val where to find him in the forest at his Onyx house he built quite some time ago. Val is a little surprised by the high number Solo gave, however it only made sense. He also did look older then Val plus he is very experienced with these jobs. Val then hears Solomon's comment about Lagi. "Lagi is a good person but sometimes he can be a little serious. He almost killed me and my associate but he healed us in the end." Val finishes his sandwich to hear Solo's offer. "I would gladly accept. Also it is very interesting that you know magic. I have always dreamed of learning magic but that can be another time. I would love to see you then. Just tell me when we can meet." Val grabs all his things and shakes Solo's hands. "Farewell, good sir." Val walks back to his apartment. The next morning Solomon made sure to get up decently early as he had made plans with Val to come over and train, he was not sure what they would train as he did not know what his specialities were whether they be martial arts or brute strength or that of weapons but he did want to get warmed up slightly before he showed up, so he would then head over to his pile of wood just outside his house made of Onyx and he would set up some logs to be chopped he would end up doing this for about two hours then stop and go inside to feed Largo as he knew Val should be arriving shortly and if they were to train he knew he would probably forget to do so till Largo pounced on one of them to do so. When Val would arrive he would ask him after greetings as to what he was thinking of training that day, and he had his own idea of what he wished to train, it would involve using his life magic to create another life humanoid, slightly bulkier that could perhaps take more damage, this would allow him to stay out of harms way himself and always make use of his spriggan and root hound more efficiently. 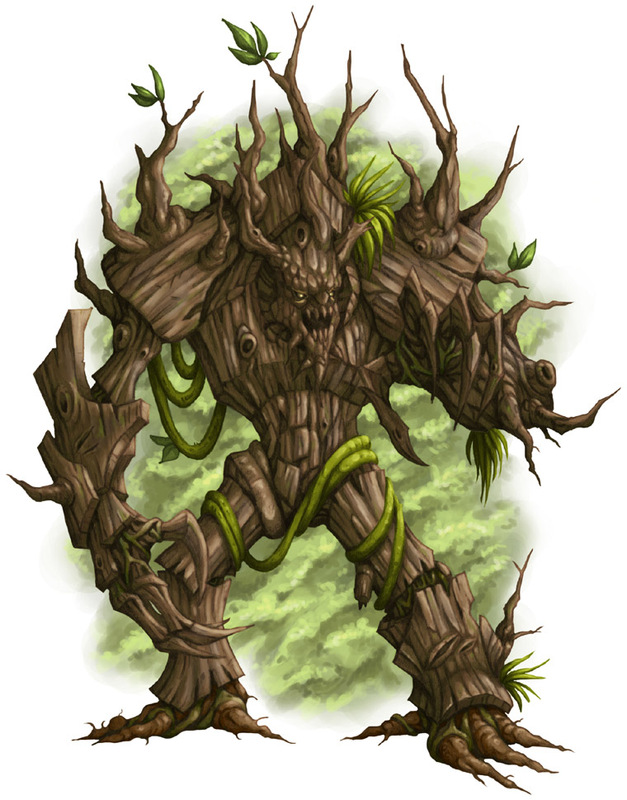 Description: Using his life magic earth and bark would erupt out of the ground and begin to form and create a large wood golem at a speed of 20 m/s the Golem can move at a speed of 20 m/s and stand 10 meters tall with a 5 meter diameter. The Golem would attack Solomon's target and would deal damage in the form of punching/kicking/grabbing or colliding with the target dealing C-tier damage, on contact the Golem would then have its Bark wrap around the target dealing C-Tier Bleeding. This spell may be sustained in the next post in order to reform a single Golem from any damage dealt to it and in order to deal C-Tier damage in the new post with the effect. Val wakes up and heads outside early morning. He needed to do some training with Solomon, but he was thinking maybe he can do some himself. But he already has some errands to do so he heads to to them. First he goes to the Marketplace, where he gets his new weapon. It was delivered from the new dungeon, which Val was a little sad that he was not able to attend it. But he moved on by going to the Market. He gathered some fresh herbs, meat, milk and headed back home. Finally, when it was time to go, he headed deep in the forest with his weapons. He reached a beautiful house, looked like it was Onyx-like material. Val heads over to Solo to start there training. After they greeted each other, Solomon asked Val what he wanted to work on. "I would like to work on something I am developing. It would be martial arts." Val was thinking of making his own basics, for beginners. He loved combat, as he was a warrior in the Reim military. The user's hands strikes out, moving at 15 m/s. The aim and precision of this technique is to force an object out of an the other individual's grasp, striking the elbow to release of the object through a sudden, but small pain in the hand which makes the opponent drop there weapon 1 meter away from them. Solomon by this point would be warmed up and ready, he had already fed Largo so there was nothing he had to worry about duty wise that he would forget about, “Hmmm alright that should be simple enough.. Did you have something in mind already?” Solomon would listen to his reply before saying, “Ok, I have something I wish to train on myself today as well and it should match with what you want to train just fine.” He would then gesture Val to follow him, “Would rather not train too close to where I live, it is just Onyx but would rather not have to build another one as I like this one and so does Largo.” After travelling far enough into the bush and away from his home he would ready himself and tell Val to do the same, “I’ll avoid what I wish to train first as it would not be good for any sort of disbarment but it will be good to train any attack or defense on.” So then after waiting to see if Val was prepared he would pull out his Rampaging Axe holding it in one hand then when he was he would then charge Val first starting at a jog leading to a sprint and when he was in range he would swing his Rampaging Axe down upon Val as a Basic Attack only aiming for his shoulder however not wishing to kill him in case he did screw up. As long as it was not too major Solomon would be able to heal any accidental damage done, doesn't mean however he did not wish to put Val through the pain of having his axe cleave into him. Val does not have any duties today so he is free. "Well, i am thinking of martial arts involving the body and sword." Then Solo leads them to a place where they can train so they do not damage the house. Solo then explains that he will not start training his technique yet but for Val is the opposite. He is thinking of what his technique could be. He needs a way to make sure the opponent did not have a weapon. However, he did not have time to think as he is attacked by an ax on his shoulder. Val had his sword drawn already so he clashes with his sword, being able to block it and doing C Tier damage to the sword. And that was the point, the exact time he can do his new skill. Maybe its a nice time to try it so the warrior takes his open hand to Solo's elbow and pushes it, hopefully releasing the ax from the immuchak's hand. Val gets his sword ready and does a basic slash, aiming at the shoulder, doing B Tier damage. Val does not want to hurt this man, however, this is training so it doesn't hurt to be a little hard. As Val blocked Solomon’s attack he smiled, it would take Solomon off guard as his arm moved outwards due to his elbow being pushed, but the next attack was quite predictable and even without his axe he could stop it, he would then just use Thorn and a Thorn would appear coming from his palm at the speed of 20 m/s and it would clash into the blade with much more force than the blade was coming at him with causing it to alter its direction away from him. It would then give Solomon enough time to distance himself from Val, and as he distanced himself he would then use Natures Greed the sight would most likely be enough to then slow Val down if nothing else did as Solomon usually did not rely on his magic, but he thought it would be good to throw something out that Val maybe had not encountered yet as it is always good to learn new things from unknown situations. Val would then be able to watch as roots and vines erupt from the ground and begin to form at a speed of 20 m/s into a spriggan 10 meters in height and 5 meter diameter. 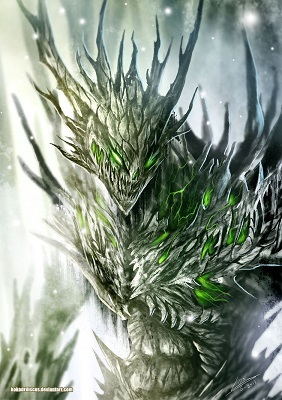 Which would then charge Val to deal C-Tier on contact and if connected the spriggan would then have its vines wrap around the target dealing C-Tier Bleeding. Solomon was unsure if Val had ever seen a spriggan or heard of one before, but it was one of the most humanoid like creatures magic could create that Solomon knew of. Which he would then determine as Val was busy dealing with that he would then attempt to use Natures Gluttony similarly again things would erupt from the ground but now bark and earth, and there in between the two of them stood a wood Golem. However Solomon would not use this to attack Val as he didn't wish to over burden him with attacks he would leave it stand there for him to target if he could get through the first spriggan. Description: Using his life magic roots and vines will erupt out of the ground and begin to form and create a Spriggan at a speed of 20 m/s the Spriggan can move at a speed of 20 m/s and stand 10 meters tall with a 5 meter diameter. The Spriggan would attack Solomon's target and would deal damage in the form of punching/kicking/grabbing or colliding with the target dealing C-tier damage, on contact the Spriggan would then have its vines wrap around the target dealing C-Tier Bleeding. This spell may be sustained in the next post in order to reform a single Spriggan from any damage dealt to it and in order to deal C-Tier damage in the new post with the effect. Val can feel the clash of the sword and the Thorn from Solomon. As Val clashes he can feel something goey on both his hands. What the hell? Val looks to see this plan-like sap and it is forming. Val tried to move his arms but the sap has harden. This is a different type of training now that Solomon started to use magic. Finally, Solo used his ability to have this beast formed. To Val, it was a surprise that an immuchak knows how to use magic. Very rare situation but now is not the time to think about that. The beast was coming after Val, charging to attack. The warrior focused on his power, his Unity Bond to gain the strength of an immuchak on his legs. As the beast strikes at Val, the human kicks out at the beast to clash. The kick was able to block the whole B Tier attack, including the bleeding damage. Then the man makes another beast, but much bigger. Val chuckled as he dashes at the Immuchak and kicks 2 times at the man, in total doing A Tier damage. Solomon would smile as the sap covered over Val’s hands, it did its job in stopping the attack and so did the spriggan he could tell that this surprised him. However he was not the only one surprised when Solomon watched as Val dealt with the spriggan just by kicking it thus the spriggan would just fall to the ground and become vines and roots once more. That amount of strength was quite surprising to Solomon at least coming from the human. Which would make Solomon change his mind quite quickly about over burdening Val as he seem to ignore the original golem and darted towards Solomon, so he would then sustain Natures Gluttony to then have the golem to move in the way of Val to clash with his kick but it was not enough however right after sustaining Natures Gluttony, Solomon also sustained Natures Greed which the golem gave the spriggan enough time to reform and make his way for Val which would be enough to stop Val’s first attack towards Solomon. But it however did not stop Val from using a second kick which Solomon thought to be perfect as he did have to show Val that magic was not all he had to use, so he would then use Fortress Wall Stance to plant his feet at a speed of 20 m/s taking a stance with his arms out so he could flex his chest and abdomen allowing himself to take the kick and Val would be able to see that it did not damage Solomon. Now having Val right in front of him he would use the opportunity to use a skill he had not used in sometime, he would then use Castle Toss to reach out and attempt to grab Val at a speed of 20 m/s then toss him 10 meters behind him, which would give Solomon and Val a gap between each other once again. 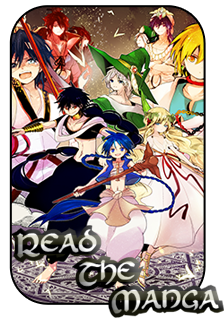 "Remember that Magic comes second only till recently did I just begin to use magic for combat." Description: He would plant his feet at a speed of 20m/s taking a stance with his arms out flexing his chest and abdomen allowing himself to take a 1 A-tier, 2 B-tier, 4 C-tier or 8 D-tier blunt or body attack. Description: Reaching out grabbing the target at 20m/s he then tosses the target 10m behind him, this would deal C-tier damage. With Val's first attack, it was blocked with the magic beasts getting sustained and reformed. Val grunted as the first kick did not work but he tried again. However, it hit Solomon, but it did no bruise whatsoever. Then the attack happened from Solomon. With great force, the immuchak threw the human behind himself. Val then gets hit against the floor with great force. The human lays on the floor, thinking of what else to do. His hands are still stuck to each other and he is already hurt. Val hears what Solomon says and looks at him as he tries to get up. "Yes, you are right. I just thought that you were more of a magician then a warrior because you started using magic. It also looks like you have great comfort with it." The human tries to get up using his feet but ultimately fails as he falls to the ground. "Is it fine you can help me and we can call it a day?" Val is already tired as he tried to use an ability for the first time. Its a good ability but Val needs a name, a name for this martial arts. Achilles he thought as he is on the floor. He imagines a school, a place, full of younger children fighting under the name Achilles. Maybe that is his goal, maybe he lost sight on peace. Val shakes his head from this dream. This cannot be his goal.